a380Loved by passengers, feared by accountants, the world’s largest airliner has run out of runway after Airbus decided to close A380 production after 12 years in service due to weak sales. The decision to halt production of the A380 superjumbo is the final act in one of Europe’s greatest industrial adventures and reflects a dearth of orders by airline bosses unwilling to back Airbus’s vision of huge jets to combat airport congestion. Air traffic is growing at a near-record pace but this has mainly generated demand for twin-engined jets nimble enough to fly directly to where people want to travel, rather than bulky four-engined jets forcing passengers to change at hub airports. And while loyal supporters like top customer Emirates say the popular 544-seat jet makes money when full, each unsold seat potentially burns a hole in airline finances because of the fuel needed to keep the huge double-decker structure aloft. “It’s an aircraft that frightens airline CFOs; the risk of failing to sell so many seats is just too high,” said a senior aerospace industry source familiar with the program. Once hailed as the industrial counterpart to Europe’s single currency, the demise of a globally recognized European symbol coincides with growing political strains between Britain, France, Germany and Spain where the plane is built. That’s in stark contrast to the display of European unity and optimism when the engineering behemoth was unveiled in front of European leaders under a spectacular light show in 2005. British Prime Minister Tony Blair called the A380 a “symbol of economic strength” while Spanish premier Jose Luis Rodriguez Zapatero called the rollout “the realization of a dream”. Passengers marveled at the European giant with room for 70 cars on its wings, looking rather like the hump-backed Boeing 747 but with the top section stretching all the way to the back. Airlines had initially rushed to place orders, expecting it to lower operating costs and boost profits as the industry crawled out of a slowdown in tourism since September 2001. Airbus boasted it would sell 700-750 A380s, which nowadays cost $446 million at list prices, and render the 747 obsolete. In fact, A380 orders barely crossed the 300 threshold and the 747 has outlived its rival, after reaching the age of 50 this week. The seeds of the A380’s fall from grace were already present behind the scenes of the 2005 launch party, insiders say. Despite public talk of unity, the huge task was about to expose fractures in Franco-German co-operation that sparked an industrial meltdown. When the delayed jet finally reached the market in 2007, the global financial crisis was starting to bite. Scale and opulence were no longer wanted. Sales slowed. At the same time, engine makers who had promised Airbus a decade of unbeatable efficiencies with their new superjumbo engines were fine-tuning even more efficient designs for the next generation of dual-engined planes, competing with the A380. Finally, a restless Airbus board started demanding a return and stronger prices just when the plane desperately needed an aggressive relaunch and fresh investment, insiders said. “It was a triple whammy,” said a person close to the debate. As demand see-sawed, so did the plane’s marketing: starting with luxuries including showers, then vaunting its green credentials with the messianic slogan ‘Saving The Planet One A380 at a Time” before joining the race to squeeze in more people and cut costs. Yet despite its own deep industrial problems, Boeing was winning the argument with its newest jet, the 787 Dreamliner. It was designed to bypass hubs served by the A380 and open routes between secondary cities: a strategy known as “point to point”. Airbus fought back, arguing that travel between megacities would nonetheless dominate air transport. But economic growth would splinter in ways Airbus did not predict. Intermediary cities are growing almost twice as fast as megacities, according to a 2018 paper posted by the Organisation for Economic Co-Operation and Development. That’s a boon for twinjets like the Boeing 787 and 777 or Airbus’s own A350, which has outsold the A380 three to one. Airbus Chief Executive Tom Enders, who was rarely seen as an enthusiastic backer of the A380, toyed with ending the project about two years ago but was persuaded to give it a last chance. But with Emirates unable to hammer out an engine deal needed to confirm its most recent A380 order, time had finally run out. “Airbus tends to think of it as a flagship; Enders looks at it and sees a lack of orders,” said a person close to the German-born CEO, who steps down in April. Some insiders worry that Airbus will lose a valuable symbol of pride and commercial audacity when production ends in 2021. Now, airline bosses are seeking assurances that Airbus will support the A380 with spare parts for years to come. Many invested in the A380 as their flagship while airports also spent heavily on new facilities. Some customers like Air France and Lufthansa may not shed too many tears, analysts say. 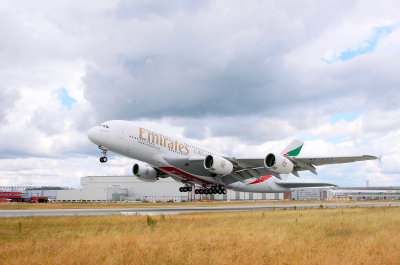 They too invested in the A380 but may also be relieved to see a potent weapon removed from Gulf rivals like Emirates, whom they accuse of flooding the market. Emirates insists it plays fairly and has called the A380 a “passenger magnet,” misunderstood and badly marketed by rivals. Its chairman said on Thursday he was disappointed in the A380’s demise, but added “we accept that this is the reality of the situation”.